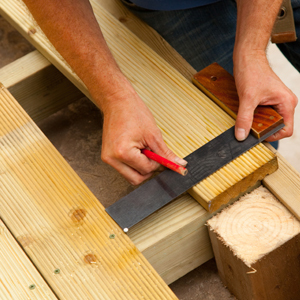 You may be thinking about adding a hardwood deck such as mahogany or tigerwood onto your home. There are a number of fabulous and breathtakingly beautiful hardwoods on the scene. Not only do some of this hardwoods take advantage of the natural beauty of the wood, some of them boast durability as well. 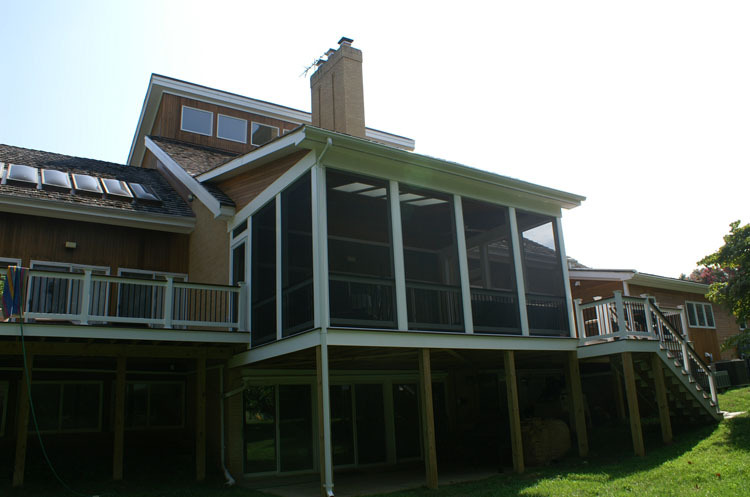 Archadeck of Maryland turns back the clock a little to focus on a project we did a few years back for a customer in Potomac, MD. We changed out an existing house wall and made it into a beautiful stone wall and then added a 3-walled screened porch with clipped corners for a panoramic view. We used Ipe flooring and a beautiful clean cedar ceiling, just a stunning combination. 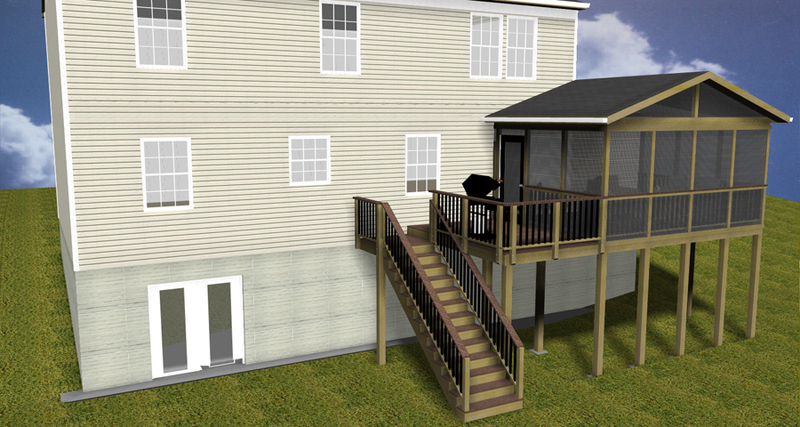 We also added a small deck off the outside edge of the screened porch, on the far wall the deck is just big enough for a BBQ. We used a pair of french doors as the exit doors, this added an air of refinement to the addition. To add character and whimsy we installed a cupola on the roof as well. The house was roughly a 1960’s home in the french colonial style and it had a mansard style roof. 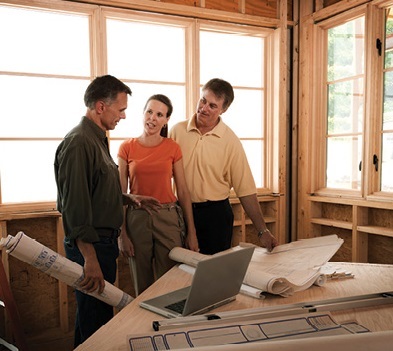 The home had a family room with a picture room with doors on either side, this is where we removed all of that and installed the wide opening to accommodate the screened porch. Along with the mansard style roof the home had cedar shakes, we matched the roof of the new structure with the same cedar shakes. 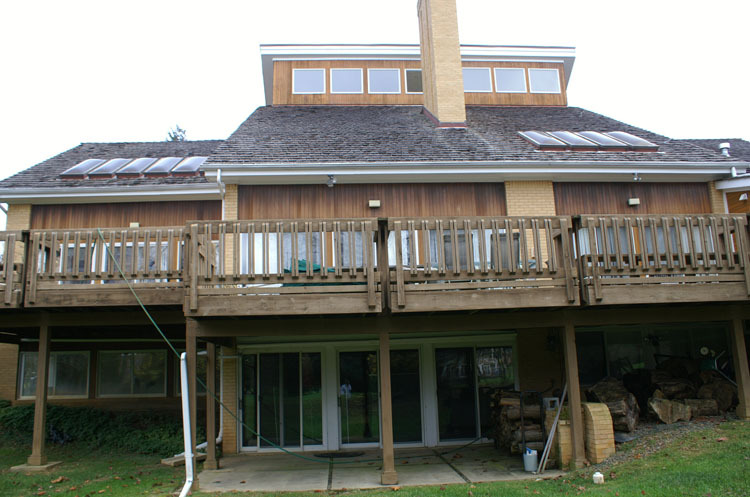 Even though this was expensive and very maintenance prone over time, it was necessary to keep the structural integrity of the home intact. This had been the 1st job we had ever finished a ceiling out with clean cedar, we used a satin finish, which looks even more elegant than a high gloss finish. The choice to use Ipe for the flooring was in part for the beauty and the other would be the extreme durability. 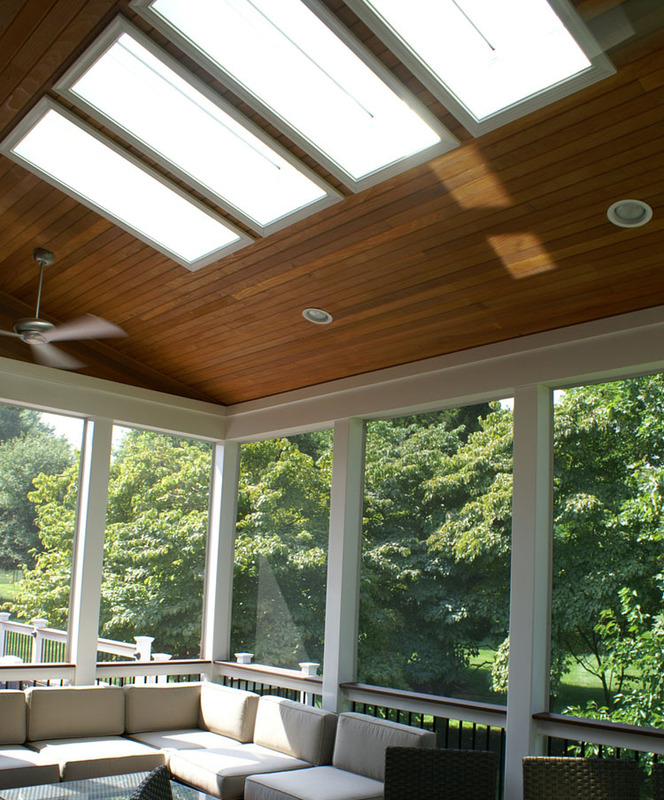 Ipe is nicknamed “ironwood” by the industry. 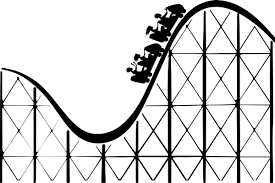 It is so hard and resilient you need to use titanium drill bits to drill through it. It will not float in fresh water because of its dense nature. In places where water and long-lasting are used in the same sentence such as floating docks and even the Annapolis yacht club, we have seen it used with much success. 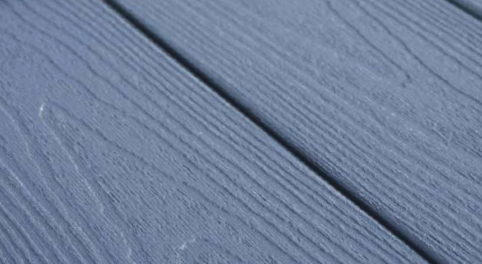 We have even heard that the New Jersey boardwalk is not made of Ipe because of its quality. Ipe is a clean wood as well, it has a dark chocolate palette with variations from board to board. Much is the look of the Brazilian hardwoods. All you need to do to keep that dark beautiful finish is seal it. It will turn a silver-gray, the sealing is only to maintain the color, because even if you choose not to seal Ipe it will not degrade . 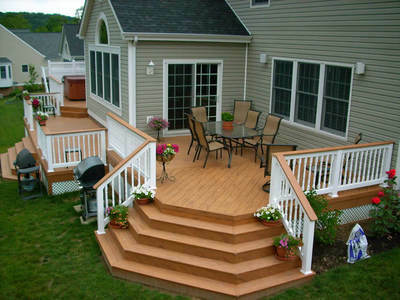 This is just one of the many happy customers we have built structures for of hardwood decking. 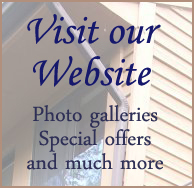 We have many more options, as well as Ipe. 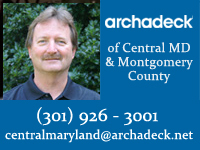 Give Archadeck of Maryland a call today to find out more at (301) 926 – 3001 or email us at centralmaryland@archadeck.net. 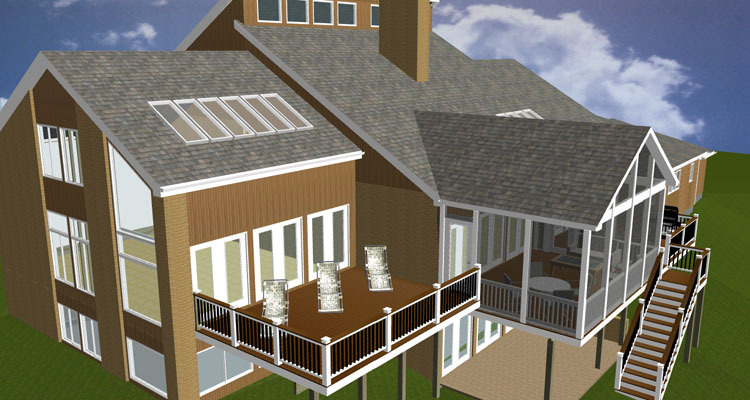 Archadeck of Maryland recently had the opportunity to work with a wonderful couple. The couple are great customers of ours, not only are they doting grandparents they are avid golfers as well. Their duplex home is in a prime location where they can enjoy their love of golf – on a golf course. They wanted us to try to come up with a solution to their problem of errant gold balls continually coming toward their home. Our job was to fix this problem from a backyard design standpoint. These golfing grandparents had an almost non-existent lot line. 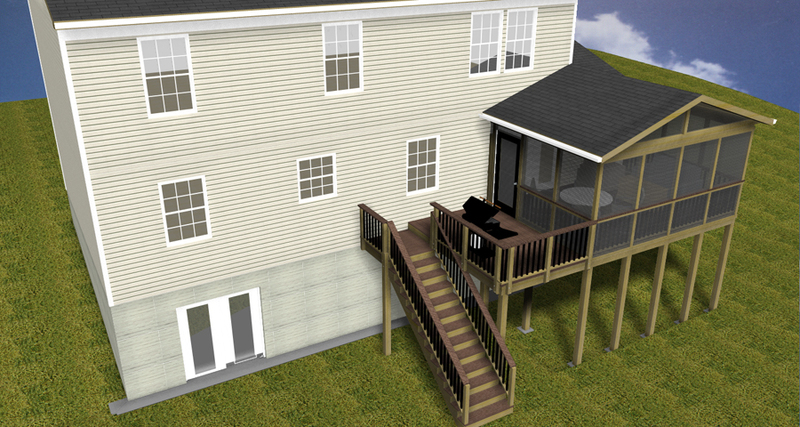 We decided on expanding the existing deck quite a bit and adding an octagon. The main deck is elevated one step up. 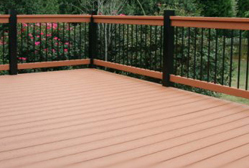 We used Fiberon horizon composite decking in the beautiful ipe color. 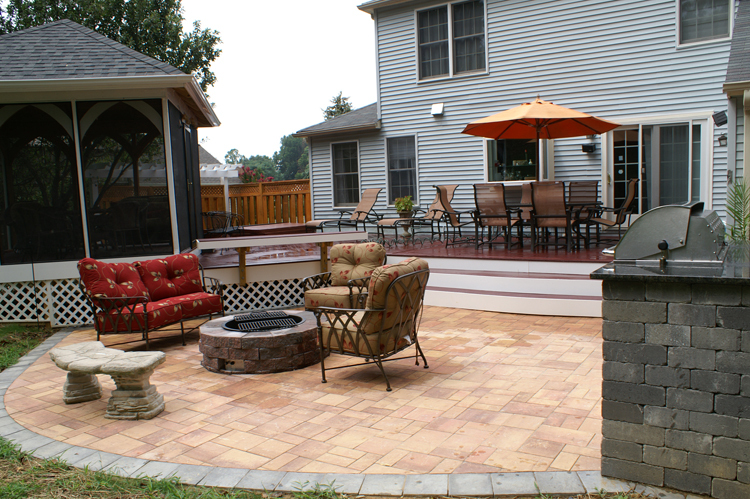 We also added a double contrasting border around both deck sections. 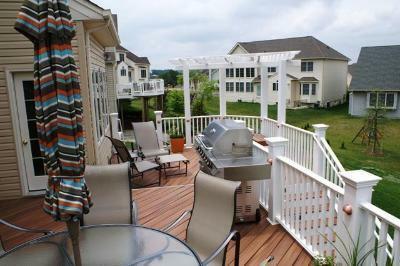 The deck was “picture framed” with two boards. 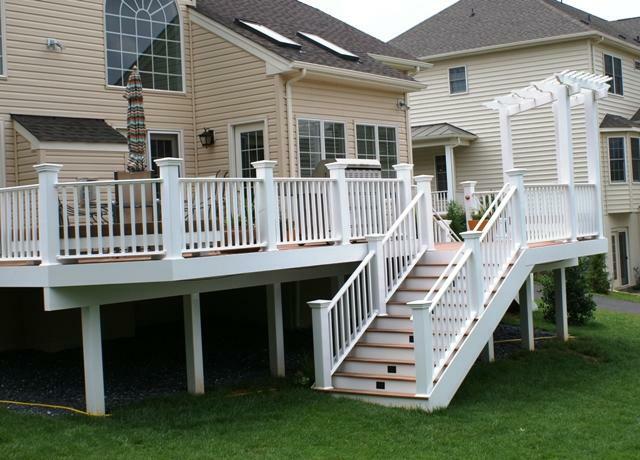 The couple used a shoreline railing by Maryland vinyl product with a decking board rail cap product on top. This new and improved deck was finished off with a vinyl trimmed pergola. We added the pergola to the top and they plan to have a shade tree slide out awning installed on it. We finished out the support beams in pvc vinyl so they have a finished look and are aesthetically appealing. 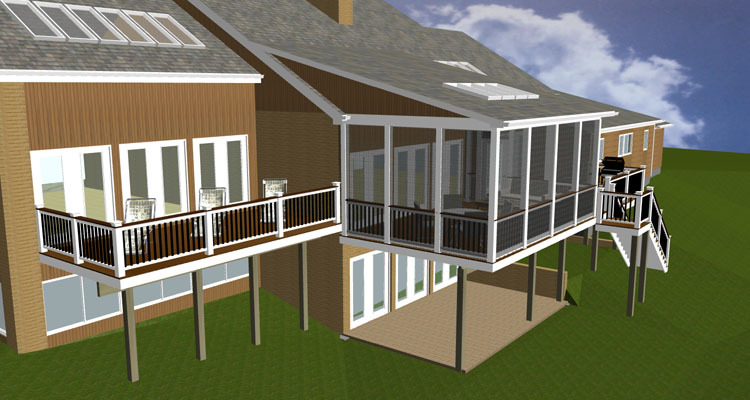 We also did the underdeck system so they could use the patio down below. 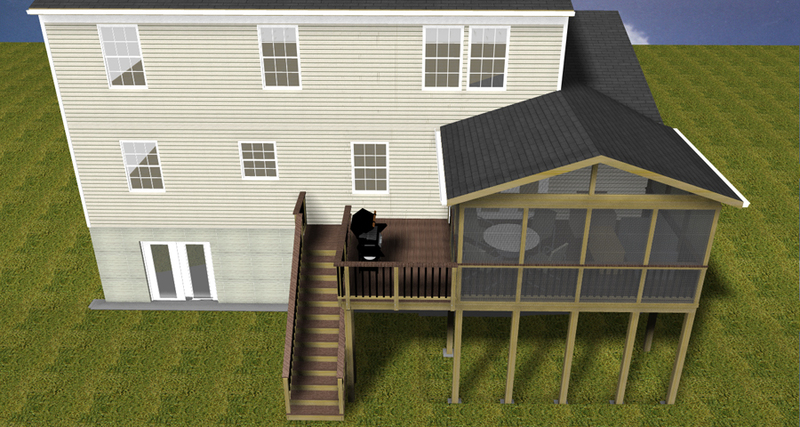 Even though they have an elevated deck, they decided not to provide stairs down to the outside. This was a security decision. 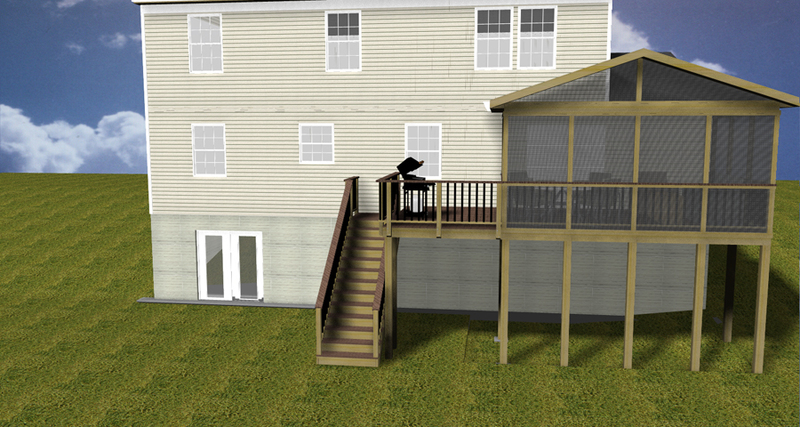 Their second level is their main living area and they don’t want to allow outside entry access to the deck. A wise decision to add more security to the home. 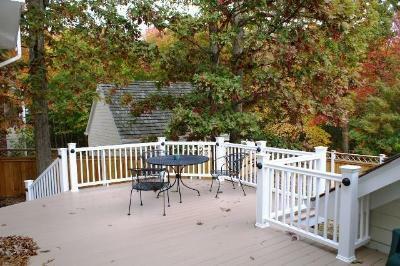 With the expansion and facelift of this couple’s deck, a pergola and some strategically placed awnings, no more unwelcome golf balls will intrude into their outdoor oasis. This makes their “tea” time fabulous.